Rinse beans soak, overnight and drain. To a large pot add about 3 tablespoons olive oil and briefly sauté the celery, garlic, whole carrot, large piece of onion and ham bone or ham hock. Break up the canned tomatoes and add to pot with all of the juices from the can. 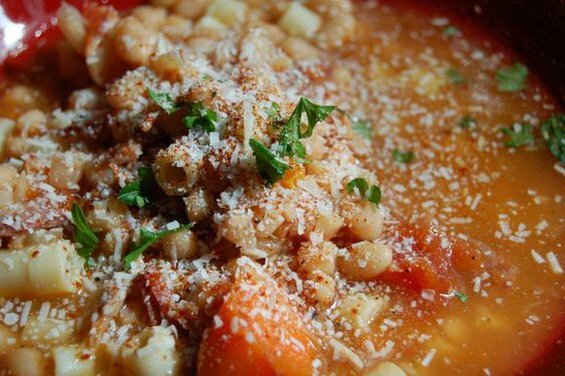 Let it all heat up while you add beans, water (optional broths if using), and herbs. Season with a little red pepper flakes, salt and pepper to taste. Simmer until beans are tender about 2-3 hours on a medium low to low simmer. Remove large chunks of onion, celery, carrots and bay leaves. Remove bones and pick meat off to add back into the soup. Season to your taste.